← America Was Never Great? Under normal conditions a top secret (TS) security clearance is good for 5 years. If a TS holder switches jobs and no longer requires a TS clearance, it is automatically put on suspension for the next 2 years or until the 5th year, whichever comes first. If it is required within that time frame, it can be easily reactivated. However, if it goes beyond the 5th year a new background check must be done by the FBI. Each time a TS background check is done it costs the taxpayers about $175,000. People who leave places like the CIA or the military, to go into private contracting, are not normally entitled to a taxpayer funded background check. However, there are exceptions. If for example, they are a key government sub-contractor. When the White House revoked the TS clearances of Brennen (ex-CIA) shown on left, Comey (ex-FBI, Strzok (ex-FBI), et al, it was done in accordance within the protocols establish decades ago. These former officials had no further access to classified materials and as a result, their TS clearance was placed on suspension, but it would have expired on the last day of the 24th month that it was not in use anyway. Security Clearances are the property of the US gov., not the individual that they were issued too. It’s always been that way. FBI Deputy Director, Andrew McCabe lost his clearance and was fired for (3) three separate violation’s of the FBI Code of Conduct / Code of Ethics. Lack of candor under oath. Lack of candor when not under oath. Improper disclosure of non-public information to the media. McCabe lost his TS clearance immediately after being fired, as was right to do under the circumstances. There have been other FBI agents that have lost their TS clearance for other breaches in the code of conduct. Drunk driving for example can get an agent fired. Moral turpitude can also be cause for firing and loss of TS clearance. Speaking in public against the Commander-in-Chief while in the military or in Federal Law Enforcement, is a terminable offense and possible jail time for military personnel. For them, it is covered in the Uniform Code of Military Justice. Military and all law enforcement officers absolutely do not have the same freedom of speech rights that a regular citizen has, it’s part of the job requirement and it always has been. For example a Federal Agent can not take part in a civil protest against the President or the government. They can not publish criticisms of the President or denounce the USA. They must remain A-political for obvious reasons. These are all documented, time tested events that will lead violators to an immediate termination of employment and loss of clearances. President Trump did not politicize anything to do with revoking of TS clearances. The people in question did. They brought that on themselves and they should have expected their TS clearance to be rescinded, this is SOP and has been for decades. Who in their right mind would want a strongly biased (former) law enforcement official or CIA agent to have access to highly sensitive documents that could be used to undermine a duly elected President? This entry was posted in Military, Morals and Ethics, National Security, politics and tagged FBI top secret clearance. Bookmark the permalink. Your process Jack makes complete sense. Wish the media would provide it too. None have that I’ve seen. I strongly agree the president should have revoked Brennan’s TS and should do the same to the others who are no longer working for the gov’t. What I don’t agree with is how he did it. Trump should have just done it and not announced it like some great accomplishment achieved. I would rather have seen Brennan trying to explain his discovery of his TS being revoked and CNN’s realization he no longer had it and therefore wouldn’t be able to provide the desirable classified exclusive information any more. Brennan’s and Clapper’s behavior toward the president has been unprofessional and unbecoming toward the office. I strongly believe they would be acting the same if Ted Cruz or any other republican had beat Hillary. The cover up of their criminal acts began long before the election. They had to have a plan to guarantee Hillary would win and a backup plan to take out the president if she didn’t to prevent us from ever finding out all of the laws they broke. On a personal note, my husband held a top secret classification in the Air Force while assigned to the SR-71, which didn’t exist at that time. He had to sign a NDA forbidding him from talking about anything he did or saw for 10 years, under the threat he would just disappear. After the 10 years had passed he shared some of his experiences, some even today I find troubling. 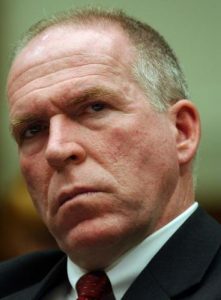 Hearing the liberal media scream Brennan loosing his TS is an attack at his 1st Amendment rights is laughable. He can still work at CNN, he just won’t get paid any more for sharing classified information any more or hinting that a specific subject is valid or not. But retired ones do. Trump’s just jealous because Brennan can compose a cogent paragraph of reasoned criticism, and The Donald, alas, cannot. Now, mind you, I take exception to Brennan’s use of that venue in the first place. Twitter? Ick. We is going to have to do some speedy psychological evolving, if we are going to stave off the ruination of our republic … but … go read some of those “erratic” tweets. Brennean is a fruit loop, just like you Lippy. If only someone could take away his clearance. Oh, wait: we can. We just need to get enough Dems in office to impeach. Pence is a religious extremist, but he is twice as competent as Trump and would govern as a statesman rather than a sideshow. BREAKING: President Trump says he expects to ‘quickly’ revoke security clearance of DOJ official Bruce Ohr, whose wife worked for DNC research firm Fusion GPS. Wonder who’s gonna be next. Clapper. I hope? Now, to many of you this may seem trivial and, actually, it is. But it is also a perfect example of how “Liberal” Democrats are not only despicable but despicably idiotic. Lever 2) The legislation is plain idiotic. It does nothing. If you ask for a soda, you get a soda with your kids meal. It is a feel good thing. So, while “Liberal” Democrats seek authoritarian control every aspect of your life, they sometimes pass idiotic, feel good legislation that does nothing. I prefer it when they do that, but it is still despicable because it is idiotic. Let’s call it such idiocy the least despicable. Level 3) So what does it accomplish? It makes some legislators and the idiots who elect them feel good. On we on the same page yet? One of the major problems with the last administration (The Clinton administration as well) is they played fast and loose with protocols and national security. President Trump socked Brennan in the wallet. A TS clearance once revoked, can never be re-instated. So, that cushy civilian job you were going to move into with your clearance? Not gonna happen. That isn’t true, but the larger problem I have is that you are celebrating the head of the US government punishing someone economically because of their speech. I thought conservatives were supposed to be concerned about threats to free speech? “Former CIA Director John Brennan, now an MSNBC contributor and brutal critic of President Donald Trump, penned an op-ed run Thursday in the New York Times that accused the president of colluding with Russia. “Director Brennan’s recent statements purport to know, as fact, that the Trump campaign colluded with a foreign power,” Burr said in a statement. He noted that if Brennan’s assertion of collusion is based on actual intelligence, he should have included it in the unclassified intelligence community assessment that was released in early 2017. The assessment was released just before Brennan resigned. “Benghazi terror attack survivor Kris Paronto made it clear this week that he won’t be defending former CIA director John Brennan anytime soon. “My principles are greater than clearances too John, especially when you and the @CIA kool-aid drinkers punishes us for not going along with the Benghazi cover-up story in order to protect you, @HillaryClinton’s & @BarackObama’s failures. You put your politics before us,” he tweeted at Mr. Brennan. Mr. Paronto, who helped write the book “13 Hours: The Inside Account of What Really Happened In Benghazi” (later turned into a feature film), told Fox News that he was given three nondisclosure agreements within six months after returning home.